Police experts Advisory Mission in Ukraine were pleasantly surprised by the extent of public campaigns, conducted by Vinnytsia police. In particular, the traffic police department on preventive work, State Automobile Inspectorate which also is responsible for the promotion of safe behaviour, go beyond the ‘caution, kids!’ words. One of their effective tools is a special bus: police shows a red card to pedestrians that violate the rules and invite them to the bus. Inside the local citizens can watch videos with fatal consequences of such violations. 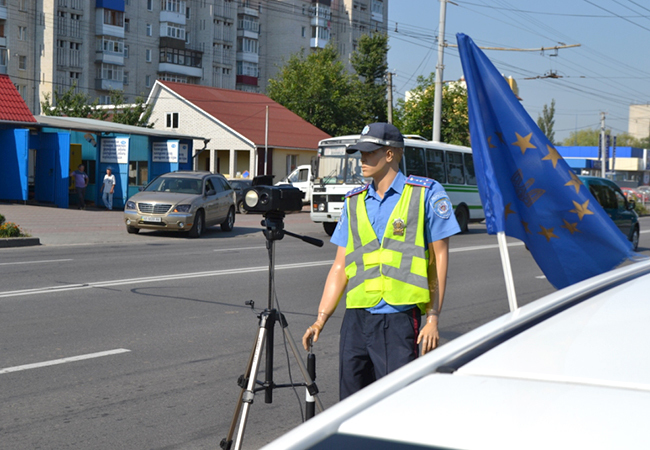 One of creative approaches to drivers was to put a policemen-mannequin on dangerous road segments. This helped to discipline local drivers and reduce the number of accidents without additional human resources. The law enforcers pay a lot of attention to young generations. Working with pupils, they conduct competitions of ‘young inspectors’ – pupils learn to regulate traffic, pass tests on traffic rules and create posters. For the smallest ones they developed a colouring book, explaining the basics of safe behavior on roads; at the meetings with kids, a ‘real’ traffic light encourages them to be good pedestrians. Inspectors also allow them to test police vehicles and equipment. This is a small part of enforcers’ initiatives and what impresses most, they implement them without serious funding. “If we had a bigger fund, we would work on completely different scale”, — says the head of the department. They discussed with representatives of the Mission the prospects of cooperation in strategic communications and advising for personnel after the police reform. “I applied for a new police and passed the first stage of selection”, — said inspector of the State Automobile Inspectorate in Vinnitsa region Oleksiy Zaverukha. “I am ready to work” – he said with confidence. Indeed, as the experience of Kyiv and other regions shows, there is nothing to fear for those, who correspond to the ethical and professional requirements of reforms.